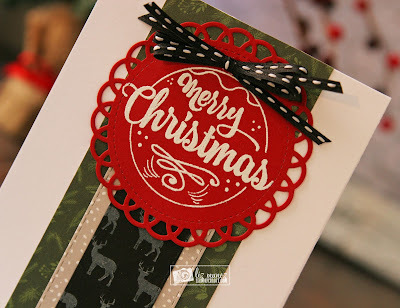 Liz's Paper Loft: MCT September Release Sneak Peak Day 2 ~ merry christmas! MCT September Release Sneak Peak Day 2 ~ merry christmas! Good Morning, it's day 2 of My Creative Time September Release Sneak Peeks! Today I get to share with you Chalkboard Christmas, You're going to love the fun "chalky" style sentiments along with a few images in this stamp set. Now what you might think is pattern paper is actually stamped. The the little reindeer is actually a stamp that I used with Picket Fence to give it that "chalky" look. OMG Miss Liz WOW YOU sure created on Super Gorgeous Card...WOW yep thought it was beautiful patterned paper and after reading your recipe now know YOU created your patter paper with the deer stamp and emobssing I'm totally awestruck with your total card..it is Spectacular...YOU so did a Super Outstanding Creative card. Such a beautiful card Liz! I LOVE how that stamp looks on the stitched doily! Beautiful card, Liz! Such a neat card, love it! I'm so impressed by your creativity! That is a gorgeous card. Love how you stamped the deer on the paper to make your own patterned paper, very clever. 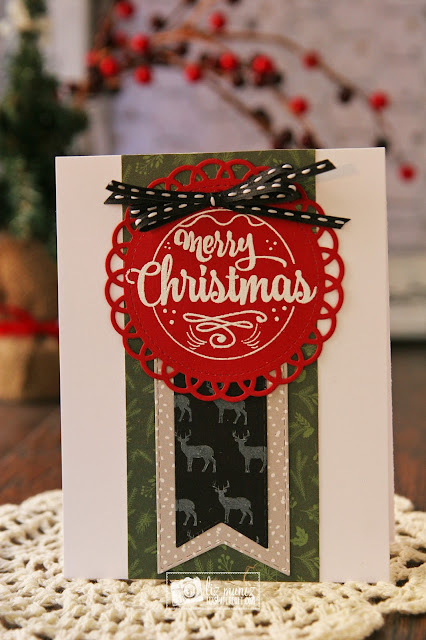 Love this card - I am partial to banner strip cards and love how you stamped the cute reindeer! 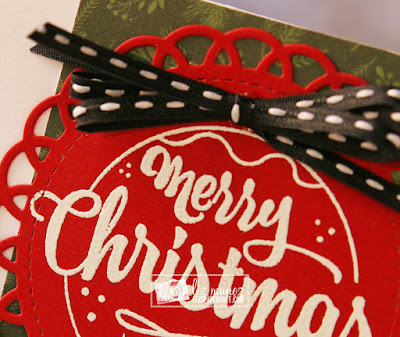 - love this Chalkboard Christmas stamp set! Love that chalky look! Can't wait to see the rest of this release! 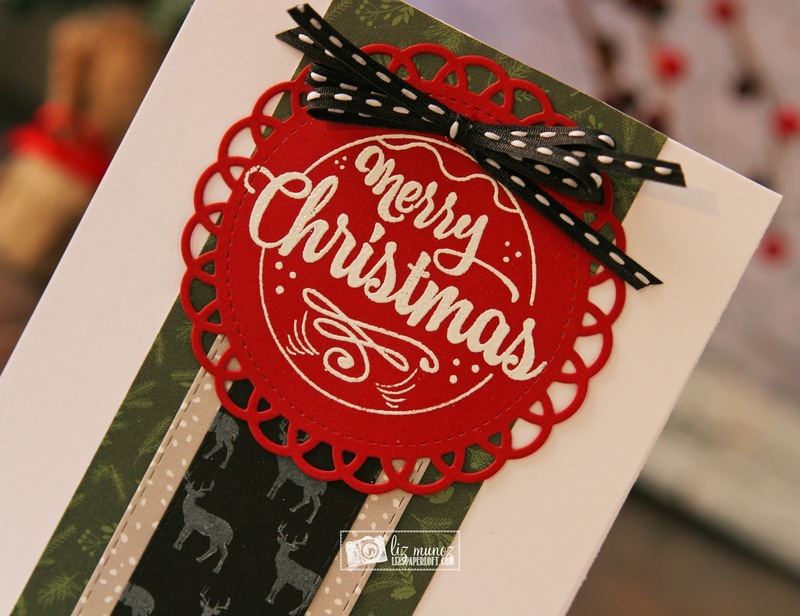 Love the layering and details on your pretty card! The stamp set is awesome with that fun chalkboard look! Fantastic card. Love the layers and that great stamp. Liz this card is just beautiful, can't wait to try some chalkboard tags and cards. Love it! Your card looks amazing! Love the layering and how you created your own background paper with the elk. Wow! This is such a cute simple card yet elegant you work is always so amazing. I love the background stamping of the banner layers. They compliment the pretty stamping on the doily and the sweet bow is perfect. Great job.